As we threw our tattered caps in the air and hailed the republic, far from home, in November 1918, we didn’t dream that it would be shaken so soon, that some of those who shouted enthusiastically until they were hoarse, would so soon become the involuntary helpers of those who now want to kill them. What made our blood flow more quickly then was not party programs, and not pedantically thought out social dogmas. Nobody was interested in the differences between Radek and Kautsky, but millions were united in the feeling, the killing has stopped, militarism has choked on itself, we are a free people in a free fatherland, starting now! The German revolution was not the result of party dogma, it was the elemental self-defence of a desperately suffering people. We know how quickly this feeling of domestic solidarity evaporated. One cannot freeze enthusiasm, but where it is strong and genuine, it gives rise to principles that provide a spark for a long time afterwards, and win back the faith of doubters. Unfortunately, the enemies of the new order are more sensitive to the fact that such principles have not yet been articulated, than its friends are. The opponents of the republic are thorough and flexible. The previous supporters of throne and altar are very good moles. The Tippelskirchs are very good at declaiming against corruption. The German-national opposition exploits every situation. There isn’t a single question between heaven and earth which isn’t answered, with deep inner conviction, “It’s the republic’s fault!” The military defeat, the terrible peace, price rises, moral decay, corruption… it’s the republic’s fault! Every dubious instinct in the popular soul is exaggerated beyond measure. The stupid arrogance of previously privileged classes is the republic’s fault, as is the primitive yearning of narrow-minded petit-bourgeois for displays of military and dynastic ostentation. And this attention to detail is deliberate. The socialists, who used to understand mass psychosis, are incompetent bunglers by comparison. All public institution are infected by the wild, monarchist-nationalist agitation. The German mafia has infiltrated schools, churches and even theatres. It is no use confronting such mob agitation with the argument that the new system cannot bring all flowery dreams to fruition in one year, we know how difficult transitional times are. Even in France, the third republic needed three decades to assert itself permanently. The French officer corps also contained royalist cliques. Honest republicans were often in a desperate minority, but steady consistency can shorten the transition, and put the new state on a secure footing. No stupid violence, no coarse attempt to replace argument with force. But, above all, no sell-out in the hope of winning the good will of those who have been brought down. The republic must be clean. Its irreproachability must disarm its opponents. The leaders of a people who have fallen on hard times must show the strictest self-discipline, otherwise the door is wide open to every kind of political immorality. The republic must be wise. It must only invoke the powerful instrument of a state of emergency in the very last resort. Every measure which recalls the methods of the old system will cause broad circles of the people to have doubts about democracy, and will give rise to bitterness and indifference. Nothing worse could happen to the republic than the disenchantment of just those parts of the population that it needs to defend it, and belong to it with their whole way of thinking. The reactionaries could be granted no greater favour than the currently practised domestic policies. This strong-arm policy corresponds exactly to the intentions of the nobleman of Oldenburg. Nobody of a reasonable disposition would object to parliament and constitution being defended from attacks from without, but the arrest of the alleged ‘intellectual agitators’ of such sad events recalls the worst practices of the times of Puttkammer. We, as democrats, are the determined opponents of Däumig and Goldschmidt, but we respect them as honourable opponents, and we know that they are as far from dubious coup d’etat conspiracies as the Imperial Minister of Defence is from statesmanly comportment. 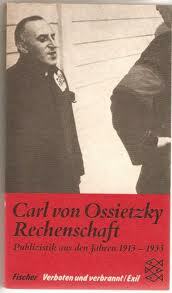 This entry was posted in 1920, Berliner Volks-Zeitung, Carl von Ossietzky. Bookmark the permalink.